Sometimes it’s hard to see the difference between a patronymic and a middle name. 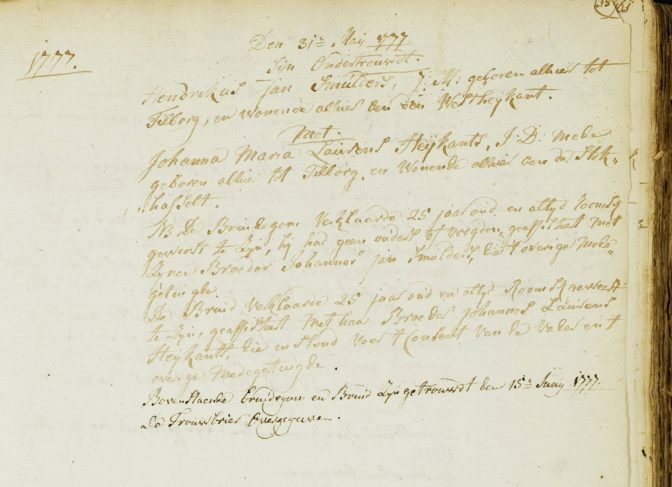 One of my ancestors, Hendrik Jan Smulders was called “Jan” because his father was named Jan. At that time, people in Tilburg didn’t use a genitive form to indicate patronymics so it’s difficult to see if “Jan” is a middle name or a patronymic. In other regions and times, the name might have been Jans, Jansen, Janssen, Janse, or Jansse, which more clearly define it as a patronymic. Another situation where a patronymic may be hard to recognize is if the base name ends with an -s. For example, “Hans” can be both a first name and a patronymic. Studying the other names in the area should show if middle names and patronymics were used. Throughout much of Dutch history, middle names were not common, and a “middle” name could well be a patronymic. Patronymics has been a problem for 200 years for researchers in America regarding Dutch ancestors. As late as 2000 an Ancestry.com member declared that the father and mother of Teunis Nyssen (Nijssen) were Nys Denyse and Helena Van Brunt, and then others added Teunis’ grandfather as Nys Denyse. (Nys/was son of Teunis and Helena surname Cortelyou; she was widow of Claus Van Brunt. ), The Denyse surname was only used by the children of Teunis’ son Dionys and his other two sons started the van Middlesworth and Tunison surnames were chosen as mandated by the British for permanent surname in about 1695. I hope you will continue to emphasize the need to find records/use sources for anyone working on their trees that connect to Dutch emigrants who went to America before 1700 as errors have been perpetuated.